What Is Google Sites and Why Use It? Google Sites is just what it sounds like—it's a website building platform from Google. If you're familiar with other website platforms like WordPress or Wix, you can think of Google Sites is something somewhat similar, but perhaps more specialized for businesses and web-based teams. If you already use other Google products and find them particularly useful for a business or organization that you run, Google Sites might just be another one to add to your digital toolbox. Here's what you need to know about it. 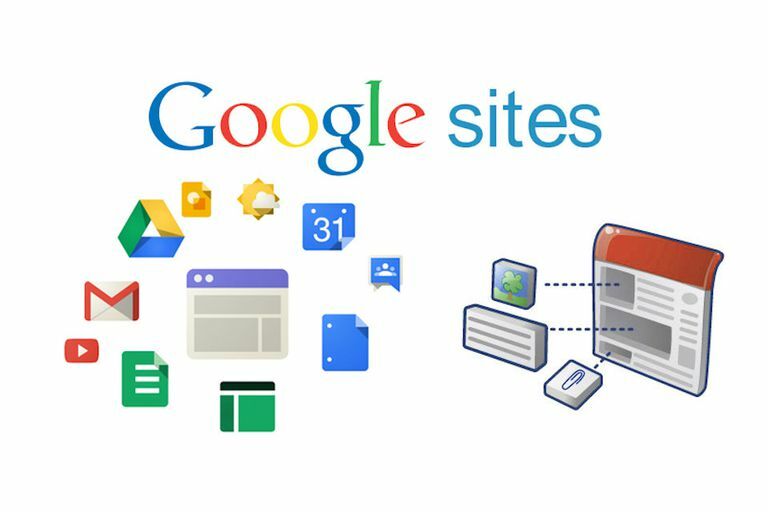 Google Sites is an app that's part of Google's G Suite, which is a premium package of Google apps that have been optimized for use by businesses. Other apps that are included are Gmail, Docs, Drive, Calendar and more. G Suite offers a free 14-day trial for those who wish to check it out, after which they'll be charged at least $5 a month for a Basic subscription that comes with 30GB of storage. You don't just get Google Sites—you get access to all of Google's other G Suite tools as well. When you got to sign up for the free trial, Google will start by asking you a few questions to learn more about you and your business. If you're not interested in eventually paying for G Suite, learn how to create a free website from scratch or check out these free blogging platforms that are just as good for website creation. Google Sites allows you to create a website without having to know how to code it yourself. It falls under the Collaborative category in G Suite, meaning that you can get other Google users in on the website creation process too, which is what makes it so powerful and such a valuable tool for teams. Like other platforms such as WordPress.com and Tumblr, Google Sites has site builder features that make it easy and intuitive to design your site the way you want. You can also add "gadgets" like calendars, maps, spreadsheets, presentations and more to make your site more functional. Choose a theme and customize it any way you want for a professional looking site that looks and functions great across all desktop and mobile screens. If you don't already have an account with G Suite, you'll be asked to create one before you can set up your Google Site. Once you've done that, you'll be asked to use your own domain that you purchased from a domain registrar. If you don't have one, you'll be given the opportunity to purchase one before you move forward. Given the endless possibilities, there are to really make Google Sites your own, you could use it for practically anything. You may find that other platforms may be more appropriate, like Shopify or Etsy, for example, if you were planning on setting up an online shop, but you'd have to use both Google Sites and those platforms to determine for yourself whether one is better than the other in terms of what best suits your style and needs. If you have a large team you work with, you may want to consider using Google Sites to build an intranet for communication purposes. The great thing about Google Sites is that you get to choose who can and can't access your site. So whether you want external visitors to be able to visit your site or you want to give collaborative editing privileges to certain users, you can easily do that with just a few clicks using Google Sites.